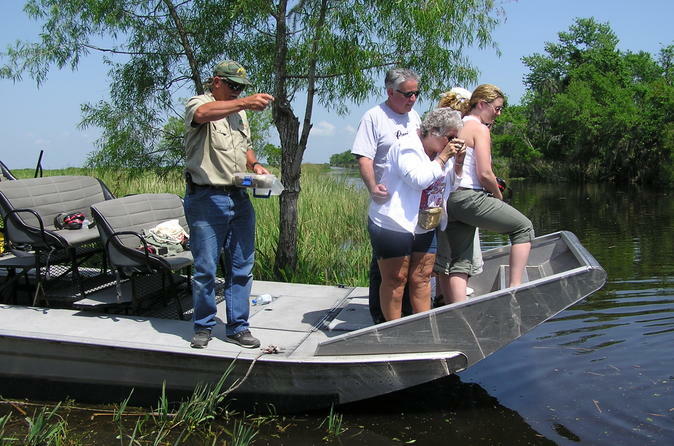 Get ready for an exhilarating 1.5 hour airboat ride deep into secluded bayous in Cajun Country. You will see all sorts of wildlife on your journey - alligators, giant catfish and nutrias. Then, continue onto Destrehan Plantation for a glimpse into the historic past of New Orleans. The small-group atmosphere with maximum 13 people ensures a more personal experience. First, you will ride out to the quaint and remote Cajun Village close to Paradis, LA for a thrilling high-speed ride onboard small airboats, comfortably gliding over marshes, deep into secluded bayous for approximately 2 hours. You may even get to hold a baby alligator, feed giant catfish, or meet a nutria face to face.